The Two Silversmiths are Jerry and Linda Hunter. See our jewelry at Artists At Work Studio & Gallery, West Main Street, Brevard, NC or at The Jeweler’s Workbench, North Main Street, Waynesville, NC. Shop our online gallery by clicking on SHOP in our Menu. 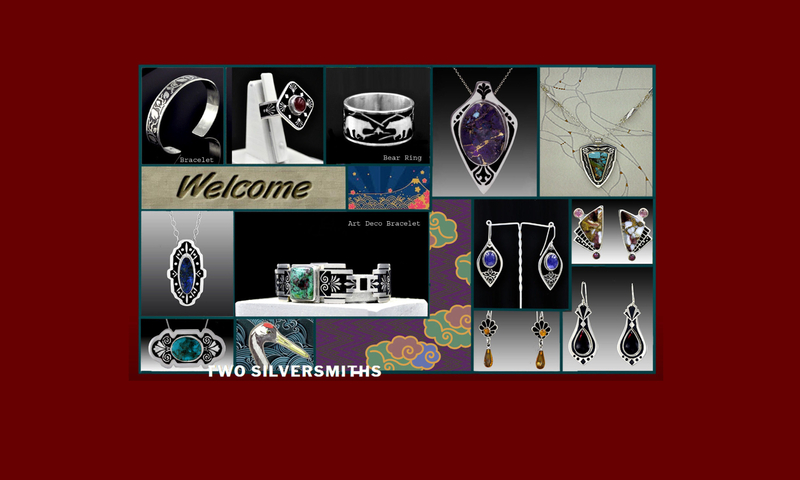 Our Facebook page, http://facebook.com/twosilversmiths , also has photographs of some of the jewelry which we have created over the past several years. Not long after Linda and I started working together on jewelry, I was reminded of William S. Burroughs’ book The Third Mind in which he explores what happens when two people work together in close harmony. Our collaborative experiences bear out the title of this book for us. Work starts with our concentrating separately on a design, but we always consult with one another for possible improvements. Together we create jewelry designs that we wouldn’t have done had we not been collaborating. This has also proven to be true in our jewelry making processes. We sometimes want to improve a method, and by talking out what we want to change, we often come up with a better way of doing a process or come up with a tool that makes a process more precise. We work in Argentium sterling silver because it yields gracefully to hammer and saw but is stubborn in doing so, and because it is capable of taking and holding as simple or as complex a form as we can imagine. Argentium sterling silver was invented in 1996 by an English professor of silversmithing. Unlike tradition sterling silver that has a pure silver content of 92.5%, Argentium has a pure silver content of 93.5%. Argentium has a small amount of the element germanium that replaces some of the copper and this changes things. This new sterling silver is highly tarnish resistant, more workable and harder than traditional sterling and many people who are allergic to traditional sterling can wear Argentium sterling. Jerry and I collaborate on all aspects of our jewelry making processes. We work on our designs separately but we are constantly consulting with each other during the process. I get our design work ready to transfer to the Argentium Sterling Silver and Jerry does the actual transfer. After Jerry does the etching, we work together to finish our pieces with sawing, filing, sanding, soldering, setting stones, etc. We both appreciate beautiful gemstones and love incorporating them into our designs. At times, we’ll choose a stone and build a piece around it. Some stones just grab us and lead us down a design path. Other times, we’ll start a design with a shape we like and then decide on a stone or stones to complement it. Working every day, bouncing ideas off of each other, working on a jewelry project and then seeing our collaboration turn into beautiful jewelry is inherently inspiring for both of us. Our design focus is primarily on Art Deco and Art Nouveau. We both admire the architecture and furniture of these art movements and their influence on the fashions and jewelry of their time. We also draw from the natural world when we are designing, incorporating flowers, leaves, clouds, the sun, animals, etc. into some of our jewelry. Our hope is that you will share our enthusiasm and love for this medium each time you wear one of our pieces. We want our creations to be fun, beautiful, exotic, unique – in other words, wearable art.